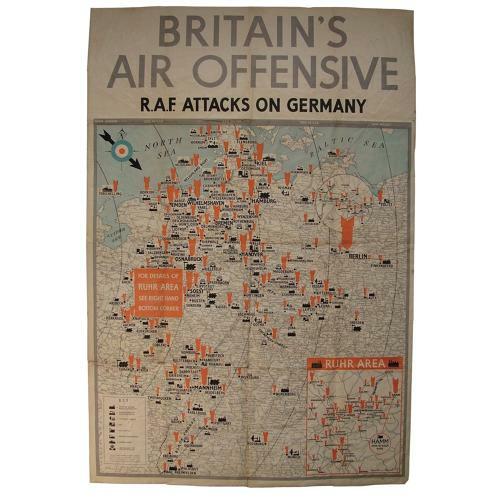 Striking original wartime poster, 'Britain's Air Offensive - R.A.F. Attacks On Germany'. Paper, approximately 50 x 75cm. Printed for H.M. Stationary Office by J Weiner Ltd. London WC1. The poster is in the form of a map of Germany marked with the major bombing targets upto October 9th 1940. These are categorised as munition works/power stations, aerodromes, aircraft works, oil refineries, railways, docks and waterways, German Navy etc. The more intense bombing of the Ruhr area is shown on an inset in the lower right corner. The poster has been folded and is quite creased with some small edge tears and dog-eared corners. Nevertheless, a super rare and dramatic poster from the early years of the war. Stock code P23268.